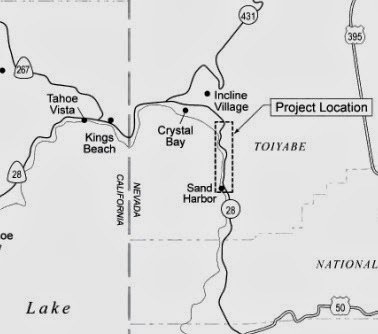 The Tahoe Transportation District has a design proposal and environmental assessment for a 3 mile bikeway from Incline Village to Sand Harbor. The proposed route would be entirely separate from the existing roadway. Project location: click to enlarge. The starting point would be adjacent to State Route 28 at Tunnel Creek in Incline Village. The bikeway would travel south along the east side of Route 28 to Sand Harbor, with an option to run on the west side of Route 28. The Bikeway would also make connections with Hidden Beach and Memorial Point. The public comment period on the environmental assessment ends April 11, 2014. Project approval by TRPA and the Federal highway Administration is scheduled for June 2014. Construction could begin in the summer of 2015 if the project is approved. “America’s Most Beautiful Bikeway” is what the Tahoe Transportation District (TTD) calls the bikeway that will someday be completed around Lake Tahoe. The last sections to be built are on the Nevada side. If the proposed section gets built, 22 miles of unfinished bikeway remain. The newest section of bikeway on the Nevada side was completed last year in the Round Hill Pines Resort area near Stateline. TTD is developing and building the bikeway to promote an alternative to car travel while encouraging a healthier lifestyle, reducing particulate run-off and improving the air quality. The 300 page environmental assessment is available is available for review on the TTD website.